One of the most common questions I get when people see my 600mm lens is how far can you see with that thing?! I also am asked very often what focal length lens should I get?! So here's a quick example thanks to a very cooperative Peregrine Falcon that allowed me to take photos at 5 different focal lengths to give you a reference. Each photo is labeled with the focal length ranging from 200mm-600mm. 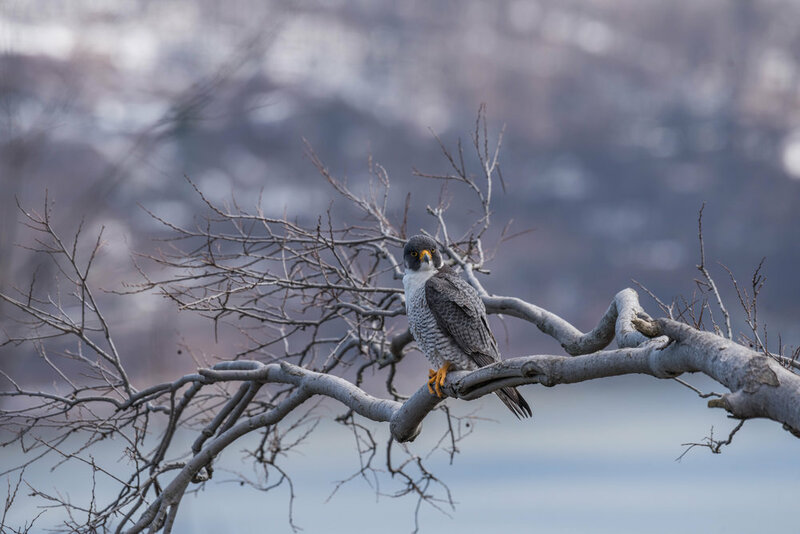 As a reference the photo to the right is a cell phone shot of the peregrine falcon sitting out on the branch. One thing you may notice is that the more focal length you have, the more compressed and out of focus the background becomes. This is why I really love the 600mm lens. It creates a nice smooth background in most photos. Hope this helps you! Photo taken on a full frame camera at 200mm. Photo taken on a full frame camera at 300mm. Photo taken on a full frame camera at 400mm. Photo taken on a full frame camera at 500mm. Photo taken on a full frame camera at 600mm.